Great idea. I can't wait to see what you did for the swap! This is wonderful. So original. I love it! I love this idea. Beautiful! I'm your newest follower. 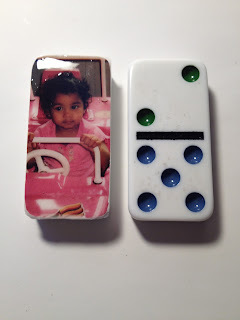 Shalana, your dominoes are too cute! Thanks for following my blog, I'm also following yours now! Can't wait to see your next project! I took a picture and cut it a little bit bigger than the domino. I used CTMH liquid glass and spread it on the flat surface of the domino. I put the picture on top and moved it around on the liquid glass to make sure it is equally spread on the back of the pic and let it dry. Once dry (I let it dry maybe 10 mins) I took my scrapbook file and went around the edges of the picture to make it the same shape of the domino. I then took the liquid glass and went over the top of the picture covering every inch. I then let it sit and dry. It didn't take that long to dry using the liquid glass.